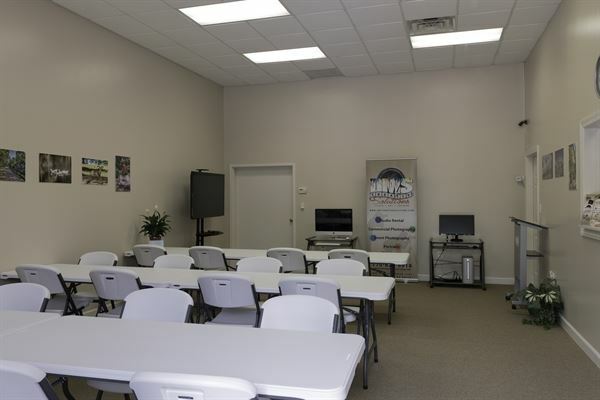 DMS Creative Solutions also has a beautiful, clean event and/or training area available for rental. Area has the capacity to seat 24 comfortably with tables or 40 without tables. The hourly rate is $50.00. If you need training or event materials created, please contact DMS Creative Solutions for pricing. Area may be rented for one hour up to 8 hours depending upon your needs and available schedule. Please call with event or training details and let us assist you. Our brand new gorgeous venue provides you and your guests with 7,000 sq. ft. of opulence, luxury and elegance. Designed with the client in mind we created the venue to host your every need. A customizable canvas allowing you or your decor team to create whatever you envision for your event. Draped under thousands of Swarovski crystal chandeliers and leveled with high gloss Japanese bamboo flooring which makes for an unforgettable experience that anyone in attendance will delight in. Whether you need our space for an upscale meeting space, a corporate event, birthday party, or a wedding reception we are open to host a wide variety of events. Come stop by for a quick tour or give us a call, we would love to assist you for your next event. Our A la Carte packages include:High grade Gold Chivari Chairs, industrial stabilized Round Tables, Two speciality Round LED Gold Baroque glass tables with matching chairs. (Fits 12), Two Red carpets, Velvet Ropes, Long rectangle Buffet Tables, Circular tall drink tables (bar stools), Three bars with two mini fridges, Chair covers (limited selection and amount with various colors and options. Check Instagram for options), Table linens / covers (limited selection and quantity with various colors and options), Utica Floor Easel stand, Napkins, Charger plates, Plates, Bowls, Utensils, Glasses, Fridge, Food warmer, Gold LED cake stand, Stage, LED DJ booth, and the state of art multi colored Double infinity mirror dance floor. Rich History Meets Modern Elegance in Downtown Atlanta Offering a balance of deep historical significance and contemporary glamour, Southern Exchange Ballrooms is the premier event venue located in the heart of Downtown Atlanta. Weddings, corporate events, conferences, conventions, parties and celebrations take on a new meaning at this Downtown Atlanta premier historic event space. Designed by Philip Shutze, Atlanta’s famous classical architect, and opened in 1927, Southern Exchange Ballrooms is the elegance of a bygone era beautifully transformed for today to showcase your life’s and your business’ special moments. The six distinct event spaces of Southern Exchange Ballrooms lend themselves well to hosting business events and conventions as well as social gatherings. Within walking distance of several of Atlanta’s best hotels and easily accessible via public transportation, Southern Exchange Ballrooms couples an exquisite atmosphere with unbeatable convenience. The Comfort Suites McDonough, conveniently located off I-75 South exit 218 offers 76 guestrooms with 4 floors. Our meeting space can accommodate up to 50 people max. Let us plan your next Corporate Meeting or your special Social event. The hotel allows outside catering. The meeting space comes with 10 top Banquet rounds or 6 ft tables for meetings. Lawrence Plantation in Rome, GA is perfect for weddings, parties and more. Less than 5 minutes from town, but miles away from ordinary! Our back porch is extra large and is perfect for a cocktail hour or a covered outdoor meeting. Get away…without going away!